Sachi Cunningham is a documentary filmmaker and Professor of Multimedia Journalism at San Francisco State University. Her award winning stories have screened at festivals worldwide, and on outlets including the New York Times, the Los Angeles Times, PBS FRONTLINE, FRONTLINE/World and the Discovery Channel. The Emmys, Webbys, and Pictures of the Year International have honored Cunningham’s work. A graduate of UC Berkeley’s Graduate School of Journalism and Brown University, Cunningham’s documentaries focus on international conflict, the arts, disability, and the ocean environment. On land she has turned her lens everywhere from the first presidential election in Afghanistan, to the oil spill in the Gulf of Mexico. 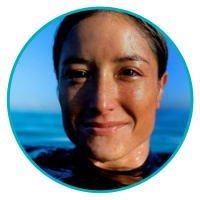 In the water, she has swum with her camera along side everything from 350-pound blue fin tuna to big wave surfers, to Olympian, Michael Phelps. Once an assistant to actress Demi Moore and Director/Producer/Writer Barry Levinson, Cunningham brings a decade of experience in feature films and commercial productions in New York, Hollywood and Tokyo to her career in journalism and filmmaking.